Workers Rights are under attack under the Gold Dome in 2019. Teamster members like you can help beat back these assaults on our freedom to organize and economic standards. If you are a Teamster who votes Republican, Democratic, or Independent your voice matters. If you are in South Georgia, Coastal Georgia, Metro Atlanta, East, West or North Georgia– you can help! Volunteers are needed to contact your local Republican and Democratic state legislators this session. Teamsters, the next GA legislative session begins on Jan. 14th! Want to help contact your legislator on critical worker related legislation? Email Local 728 Political Coordinator at bspeight@teamsterslocal728.org for more info. The James R. Hoffa Memorial Scholarship application process is now OPEN for 2019! The JRH Memorial Fund is an independent organization established and registered as a tax-exempt entity.The Fund is established solely to provide scholarships to the child or dependent of a member of the International Brotherhood of Teamsters. Eligibility: For the sons, daughters and financial dependents of Teamster members). 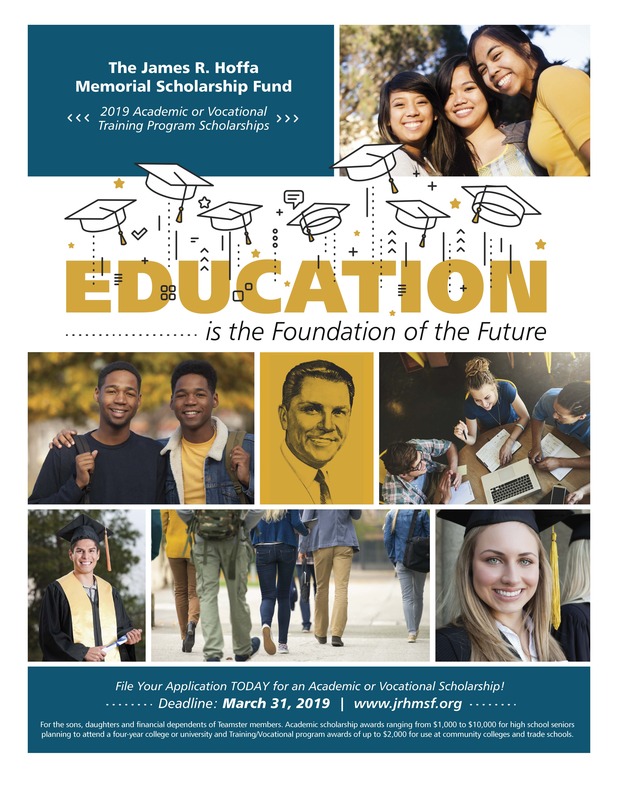 Academic scholarships ranging from $1,000 to $10,000 for high school seniors planning to attend a four-year college or university and Training/Vocational program awards of up to $2,000 for use at community colleges and trade schools.